Holidays to Turkey can vary widely depending on where you stay, but each destination offers exciting activities and a friendly atmosphere. Here are our top ten reasons why everyone should try a holiday in Turkey! Traditional Turkish baths are a great place to take some time out and really pamper your body! A mix of saunas, body scrubs and mud baths will leave you feeling relaxed, squeaky clean, and utterly rejuvenated. There are plenty of activities available in Turkey to get the adrenalin going. 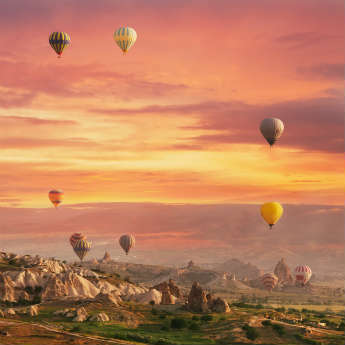 Take a hot air balloon ride over Cappadocia, go paragliding, or have a go at white water rafting! If you're on holiday in Marmaris, it's actually possible to take a day trip to the Greek island of Rhodes. The trip takes less than an hour by ferry and is fairly inexpensive. Turkey has a complex culture that has been influenced by many civilisations over the years. The country is home to ancient mosques, churches and palaces, and has plenty of museums to help you discover Turkey's past. Turkey has a wide variety of sandy and pebbled beaches, accompanied by a clear and refreshing sea. The best way to visit all the beaches is to book a sailing tour and see the coastline by yacht. Turkish cuisine is an interesting mix of Mediterranean and Middle Eastern influence, featuring Turkish tea, spiced kebabs and freshly-cooked fish. Sampling the local fare is an essential part of your holiday in Turkey. When the sun goes down, Turkey really comes alive. Head to Bodrum or Marmaris for lively bars and nightclubs, or experience more traditional Turkish bars in Istanbul. Mount Nemrut is a 7,001 ft high mountain situated in Southeastern Turkey. Available to visit as one or two day excursions you will experience some of Turkey's most fascinating history whilst catching some stunning views of the sunset at the same time. Children and adults alike will find thrills at Turkey's water parks! Adaland Kisadasi, Europe's largest water park, is situated here, along with Aqua Dream in Marmaris. Turkey is famous for its markets selling everthing from rich fabrics to fragrant spices. Sellers will expect you to haggle, so don't be afraid to push for the price you want! Tempted by Turkey? 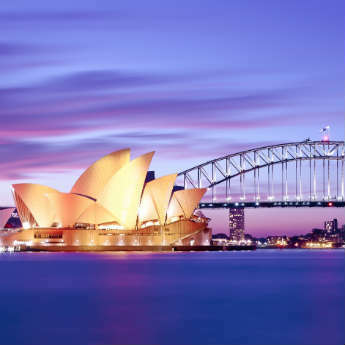 Search and compare great deals to find your perfect holiday!